After spending years in development hell, Final Fantasy XV (FFXV) was finally released last year. Much has already been said about the game it is, the game it was supposed to be and the game it is turning into thanks to the continued addition of Episodes and crossovers. I didn’t follow FFXV’s ten-year production cycle and I have to admit that I’m not the biggest fan of it either. However, I am trained in (and enjoy) finding and analysing symbols and motifs which ultimately help in understanding a story and characters better. Throughout the game, Noctis shows a Hamlet’ian reluctance to be crowned that many who played the game can’t explain beyond a simple “he doesn’t want to be king because he likes to fish with his boys.” While I think that is indeed one reason it is not the main reason as Noctis shows his characteristic reluctance and apathy from the start. To find out that reason, I dug deeper, informed myself on FFXV’s and Versus XIII’s development and ultimately found what I believe to be the lost lore of Eos. Please bear in mind that this is my take on it and can be considered as nothing more than my head-canon and not a review or a critique. The key to unlock this mystery is death. Death was a central motif during the early stages of FFXV’s / Versus XIII’s development which had to be toned down due to regulations about depicting death as a religion. Unfortunately, by doing so the game ended up losing something integral that explained much about the characters’ motivation, mood and even their clothes. Thankfully, I think there are enough remnants left behind to piece this lost lore back together. The first piece of the puzzle can be found in an early trailer for Versus XIII. 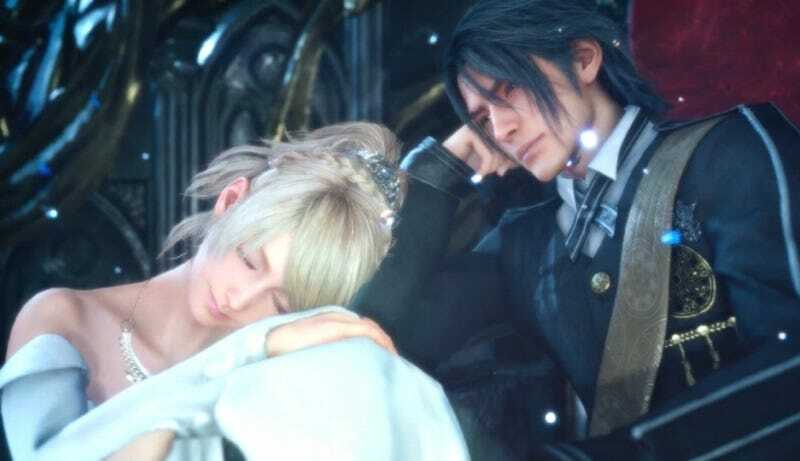 In the trailer, Noctis meets Stella, his betrothed, for the first time. Stella, of course, turned into Luna by the time we got to play the game but their roles remained largely the same. In their relatively short exchange, some key bits about a legend of Eos are revealed. Noctis and Stella both possess powers, including the ability to see souls depart to the afterlife, granted to them by Etro, the goddess of death, who also serves as the connection to the world of Final Fantasy XIII. In order to gain those powers one must have had a near-death experience and have lost someone in exchange. In the fifth and final episode of the prequel anime Brotherhood we see that Noctis’ traumatic near-death experience happened at a relatively young age when he and his convoy were attacked by a daemon. This possibilty to gain insight through loss was inspired by Norse mythology. Odin sacrifices one of his eyes to gain knowledge and Odin is of course not the only reference to Norse mythology. Noctis and Stella further talk about a legend, though, this being a trailer, they leave a lot of details out. Later on in the final game, we find out what the legend is about and it follows the same pattern as receiving Etro’s gift. The prophecy tells of the world of Eos being engulfed in darkness. To banish that darkness and return light, the Chosen King or King of Light has to sacrifice himself. The King of Light is thus a messianic figure who saves the world at the cost of his own life. Due to Noctis being royal and having received Etro’s gift, it is generally assumed that he is the Chosen King of Light that was promised, something he is made aware of from an early age. To put it in simpler terms, from a young age on Noctis is taught that he is going to be king one day so that he can die. It is his destiny to die for the greater good and he has to live knowing that. Is it, thus, a surprise that he does not want to be king? Now, some might say that Regis and his court wouldn’t tell a young boy that he has to die, yet what if death was revered by the masses? What if it was considered the greatest honour to die for a noble cause? Because that is exactly what the people of the Kingdom of Lucis believe. They, including Noctis, revere death. Noctis and Luna are seen reading the Cosmogony, a book containing the legend of the King of Light, when they are young. It is simply something that they grow up with. Additionally, as I mentioned above, death iconography could initially be found everywhere. The painting of Etro is held by a Grim Reaper-esque figure, the name of the capitol of Lucis, Insomnia, calls to mind the myth of Death and his cousin Sleep, a wigned skull appears on the official emblem of Lucis and Noctis travels from one grave of a dead king to another in order to gain the powers of the dead, thus the graves take on a religious aspect and gain shrine-like qualities in which relics are worshipped. Even the all black clothing worn by the higher ups of Lucis was explicitly chosen to allude to the death cult of Lucis as Hajime Tabata himself has confirmed. Years later, Noctis is now a young adult and, understandably, has not grown more willing to accept his cruel fate. He is reluctant to become king as that would also make him the King of Light (Lucis is taken from the Latin “lux” for “light.”) He is emotionally unprepared for his destiny and even more unprepared for Nifelheim’s sudden attack in which his father dies, effectively making him king. Coping with his father’s death and the sudden realisation of his own impeding death, which came much sooner than he ever could anticipate, Noctis grows more apathetic and reluctant about his role as saviour. As he spends time with his friends, however, he learns what it means to be a king and finds something worth not just fighting or protecting for, but something to die for. Yet, showing great character depths, Noctis doesn’t welcome his fate even after this realisation. Yes, he has found something worth dying for but he would rather live for and with it. We’ve known for some time that Versus XIII would have been a much darker game than FFXV turned out to be. As I hope I was able to illustrate, it would have featured the theme of death (and various allusions to real world mythologies and religions) more prominently, thereby expanding the world and lore of the game, its setting and characters, ultimately creating a different and much darker experience. Whether you’ve enjoyed FFXV or not, I think the allure of what could have been and what was lost is very intriguing.